Searching for a cabin in Downtown Pigeon Forge, TN for your vacation or family reunion? Come stay at "All Together Now" at Arrowhead Resort. 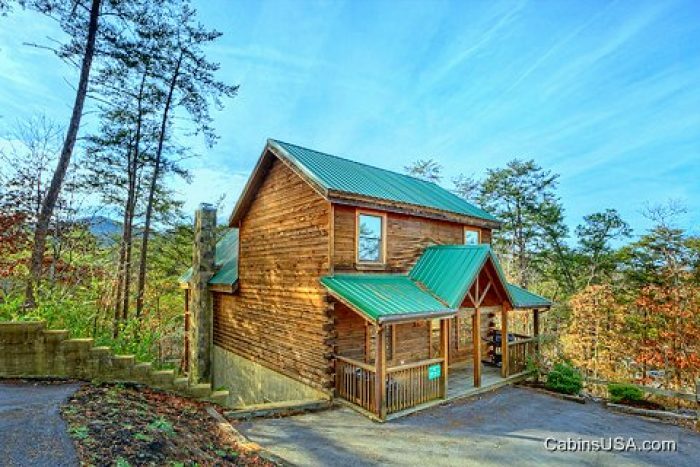 Located less than a mile off the thrilling action-packed Pigeon Forge Parkway, you and your family will find this cabin the ideal vacation accommodations in the heart of Pigeon Forge. While conveniently located, you'll still feel like you're miles away in the countryside at this cabin getaway. "All Together Now" is one of our popular Arrowhead Resort cabin rentals for groups, large families or family reunion lodgings. This oversized 3-story cabin downtown Pigeon Forge boasts scenic views from the year-round hot tub on the covered deck. Additionally, this cabin offers summertime fun at the resort swimming pool. Back at your cabin, you can enjoy a luxurious living space on their cabin retreat. This cabin boasts 2 living, one downstairs and one upstairs, each provide separate areas for socializing as well as additional sleeping space with sleeper sofas. The main level living area features gorgeous furnishings that are perfect for lounging in front of the gas fireplace. The cabin's fully equipped open, spacious kitchen offers a space for the chefs in the group to prepare anytime meals and snacks. Downstairs, the game area offers guests a chance to enjoy friendly competition at the pool table or at the sit-down, multi arcade game. This space also features a media room area with a 75" TV and rows of theater style seating. When it's time to turn in for the night, there is no shortage of sleeping space in this cabin. Containing 3 king-size beds, 2 queen-size beds, and 2 twin-sized bunk beds, everyone will have a place to sleep comfortably in the Smokies! "A Romantic Journey," "Royal Romance," "Almost Heaven," and "Double View Lodge." Book your cabin in Downtown Pigeon Forge, TN today and enjoy 15% online booking discount! Come enjoy a memorable mountain getaway at "All Together Now."